HR 4686 UMI (HR 4686 Ursae Minoris). Eleven naked eye stars (defined as sixth magnitude or brighter, that is, brighter than 6.5) can be found in a six-degree-wide box centered on Polaris, which dominates the set, six in Ursa Minor (including HR 4686, the name from the Bright Star Catalogue), the rest in Cepheus. At sixth magnitude, HR 4686 is the third faintest (beaten out Lambda UMi and HR 286, the latter tucked up against Polaris). Polaris (the jewel in a small semicircle of faint telescopic stars called the "Engagement Ring") is centered in a six-degree-wide field of view that shows a variety of other "polar stars." HR 4686 is just to the right of the top center edge. Lamdba Ursae Minoris is the reddish star up and to the right of Polaris, while Yildun (Delta UMi) is the brighter of the two stars at the upper right corner. 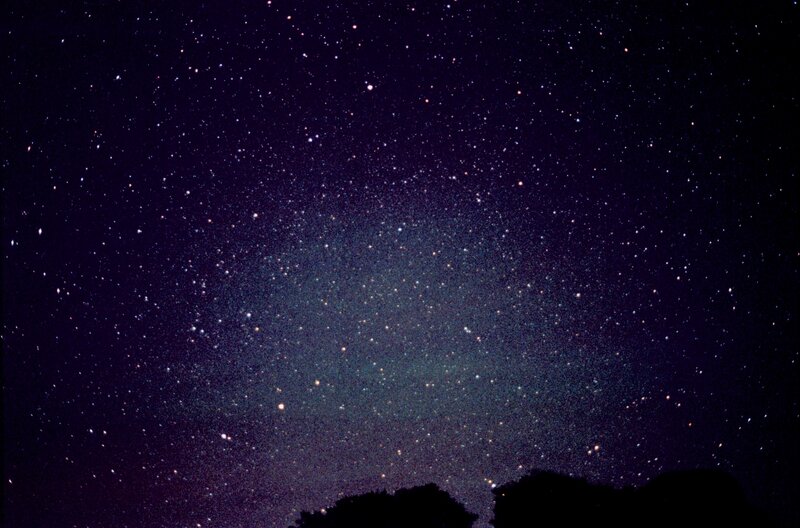 Roughly between Lambda and Polaris lies the North Celestial Pole, around which they all seem to revolve. HR 4686 is the bend in the stem of the English Rose, a "constellation" fully visible only through the telescope that was invented by Robert Hooke and presented in his "Discourse on Earthquakes." 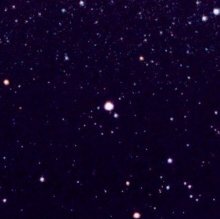 While the other stars are not visible in the above photo, the charming Rose can be seen down and just to the right of Polaris in the deep image of Ursa Minor. Can you find it? 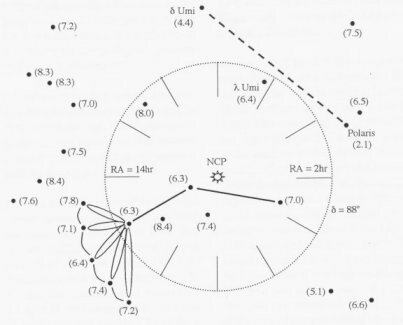 Information and drawing from Martin Beech, "In Search of the English Rose, Robert Hooke's Lost Constellation," in the Journal of the Royal Astronomical Society of Canada, October 2004, p. 183.
a contemporary of Isaac Newton, thus showing that even the faintest of the sky's naked eye stars can carry their own charm.